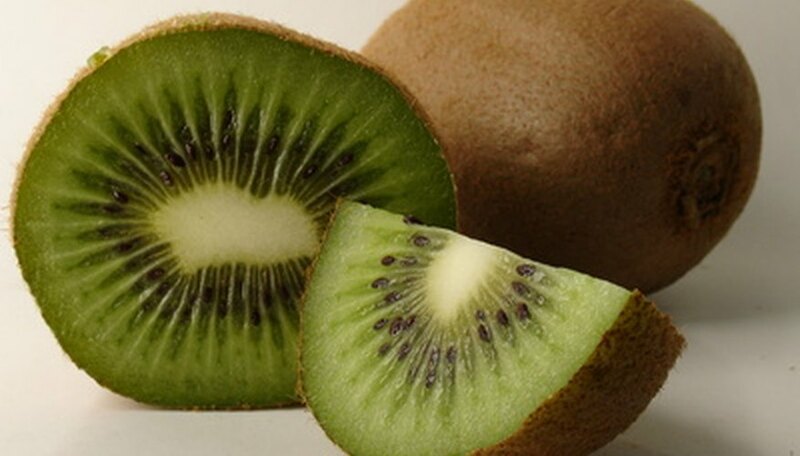 Kiwi vines are native to Asia and produce delicious green fruits that ripen in October. These fast-growing, long vines grow best in regions where minimum winter temperatures stay above 10 degrees Fahrenheit. You'll need to plant a male kiwi vine and at least one female vine for proper cross-pollination and fruit production. You can plant up to eight female kiwi vines for every male vine. The optimal time to plant your kiwi vines is in the spring, after the last frost has passed. Select a planting site for your kiwi vines that is in full sunlight and has well-draining soil. Plant the vines beside a fence, or erect an arbor or trellis that is at least 6 to 7 feet tall for each vine. Dig planting holes for the male and female kiwi vines that are about 15 feet apart. Dig the holes so that they’re about the same depth as and twice the width of the nursery containers or root balls. Loosen the soil around the sides and bottom of the planting holes. Mix into the displaced soil some well-rotted organic compost or manure. Remove the kiwi vines from their nursery containers carefully. Loosen the roots gently and set the root balls into the planting holes, spreading the roots out to the sides of the planting holes. Backfill the planting holes with the amended displaced soil, planting the kiwi vines at the same depth as they were planted in their nursery containers. Water the soil thoroughly to soak the soil down to the root balls, removing any air pockets from around the roots. Cut back the main stem of the female kiwi vine so that it’s about 12 inches tall and has four to five buds. Water the kiwi vines deeply once or twice a week to supplement rainfall during dry spells in the summer. If you're attempting to plant the kiwi vines in heavier or more compacted soil, try to plant them on a slope to encourage good drainage. You can spread organic mulch around your kiwi vines in a 3-foot circle on the ground to control weeds. Make the mulch layer about 3 inches thick. Don't plant the male and female kiwi vines more than 50 feet apart to ensure adequate cross-pollination. Don't allow the kiwi vines' roots to dry out when you're preparing to plant them. Keep the roots watered and moist at all times in the nursery container or burlap.